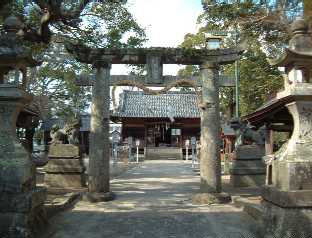 Toyotamahime Shrine is well known as the deity of Japan's three major waters of beautiful skin. People staying at Ureshino Onsen for therapeutic purposes have visited this shrine since ancient times to pray to be cured form dematological disease (vitiligo, or 'shiro namazu' in Japanese, which literally means 'white catfish'). The catfish has been said to be a messenger of the chief deity, Toyotamahime. 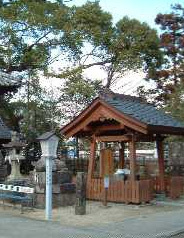 A small shrine was also dedicated for the White Catfish in the precincts. This Toyotamahime Shrine is very popular among ladies who seek divine intervention to aquire beautiful skin. Established about 620 years ago, this temple has a long and distinguished history. It was used as an officially designated lodging for Nagasaki's magistrate and the feudal lord during the Edo period (1603-1867). The temple enshrines a wooden Buddha of Healing made by Unkei, one of the greatest sculptors in history, as its principle image. About 400 bougainvilleas of over 25 varieties are forming a canopy in the extensive 826-square-meter greenhouse, one of the largest of its type in Japan. Since they bloom throughout the year and the greenhouse is located in the middle of the hot spring town, you can visit it in Yukata, inn's cotton kimono, during a stroll around the town. Todoroki (literally "roaring") Falls is named after the thunderous, roaring sound of the water that falls there. The waterfall is about 11 meters high, consists of three stages, and has a 2,500 m2 basin. Paths and parks have been constructed around the falls. Many people visit to see cherry blossoms in spring, and enjoy the natural coolness in summer. Perfect for a picnic! Ducks also gather at the waterfront. You passing through the entrance gate, Hizen Yume Kaido, an authentic Ninja Village, appears in front of you. This park is a reproduction of the Nagasaki Kaido Road of the early Edo Period (1603-1867). 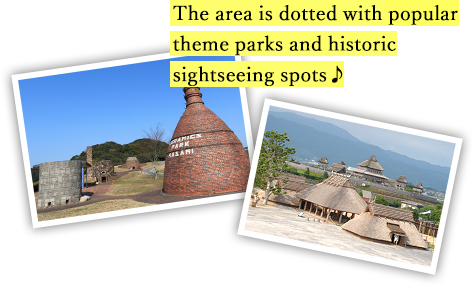 This is an experience-based spot offering lots of fun with various activities like Ninja costume photo shooting, Ninja experience for little kids, Ninja shows and street performances, etc. 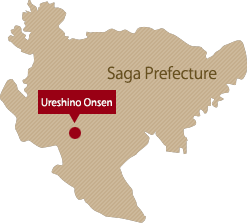 Ureshino is also famous as a production site of Hizen Yoshida ware. It has a very long history, and a broken piece of pottery made around 1577 was found at the bottom of the Narutani River, upstream of the Haguchi River, which runs through Yoshida village. 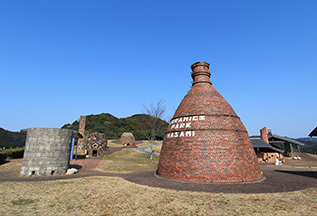 Twelve rare kilns from around the world from ancient times to the early modern period have been reproduced in the World Kiln Square located on a small hill in Hasami Ceramic Park. The histories and technologies of world kilns are introduced, and these kilns are used to fire ceramics at various events in this educational ceramic park. This science museum introduces Saga Prefecture's history and Earth's natural phenomena as well as space matters. 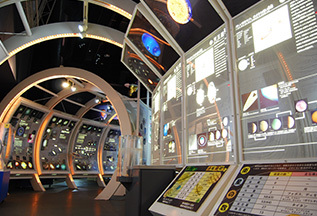 The museum is divided into some zones including Earth Discovery Zone and Space Discovery Zone. 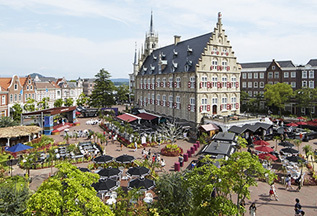 Most of the exhibitions are experience-based, so visitors from children to grown-ups will enjoy their firsthand experiences..
Huis Ten Bosch, with its vast 1.52 million square meter premises, is the largest theme park in Japan. The park reproduces a European town and is full of seasonal flowers. Meanwhile, the magnificent illuminations at night invite visitors into a fantastical world. The various attractions in the park are popular with both children and grown-ups. The Yayoi period, the 5th century B.C. to the 3rd century A.D., saw people begin rice cultivation and shift to living in permanent settlements. It can be said the origin of Japanese culture was formed in this era. 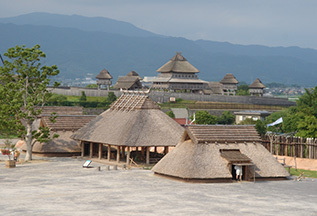 The Yoshinogari Ruins are located on a belt-shaped terrace spreading from the southern foothills of the Sefuri Mountains to Saga Plains. It has been well known since the old times that the site is dotted with many ruins. Creatures on earth have long lived in a state of harmony by the law of nature. We, human beings, are no exception. 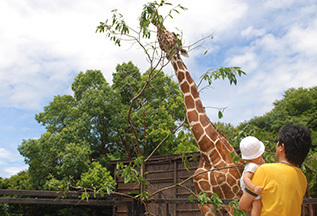 Nagasaki Bio Park's objective is to create a biology park to tell as many people as possible about how Nature is well-balanced and its preciousness. 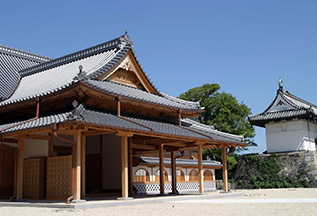 This park, selected as one of Japan's Top 100 Historical Parks, contains cultural facilities including a museum, a gallery, a library, a gymnasium, and the Saga Castle History Museum (opened in August 2004).